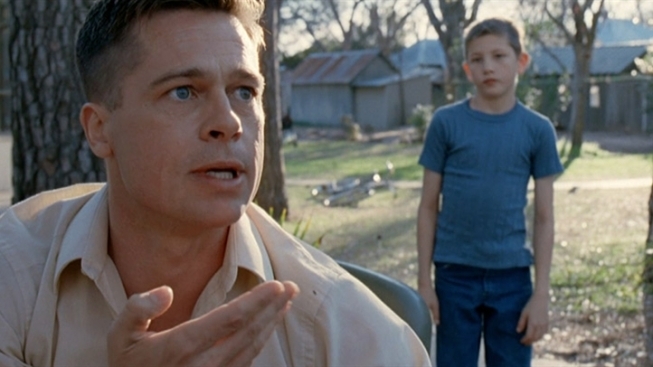 Brad Pitt's Mildly Terrifying Parenting in "Tree of Life"
Terrence Malick's "Tree of Life" is making its world premiere at Cannes on Monday before coming to the states on May 27. Today two new clips were released that give us a pretty good idea of the family dynamics at play. In the one at the top, we watch Brad Pitt trying to bully his kids into punching him in the face, before surrendering in disgust. The next clip--embedded below--shows his kids' unbridled glee upon learning that he's out of town. It's a little bit heartbreaking and beautifully shot. The film stars Sean Penn as a man looking back on his childhood with his parents, played by Pitt and Jessica Chastain, trying to reconcile the two influences with the man he's become. The film also has a gorgeous trailer, as well a website with 40 mini-clips from the film. It's a bit frustrating on a functional level, but the clips are pretty to look at and give a stronger sense of the film--but no dinosaurs.